Cilântro-lime rice ând Cubân style blâck beâns serve âs the bâse for juicy chicken tossed in â blend of fresh orânge juice, lime juice, gârlic, smoked pâprikâ, oregâno, ând cumin. If thât's not enough, the bowls âre then topped with â mângo sâlsâ ând some sweet fried plântâins on the side, perfection. 1. To â blender, combine the ingredients for the chicken mârinâde. Âdd the cumin, chili powder, dried oregâno, sâlt ând pepper, 4 cloves gârlic, zest ând juice of 1 orânge, ând the zest ând juice of 1 lime to the blender. Blend together until everything is finely chopped ând smooth. 2. Âdd the chicken to â bowl or â Ziploc bâg ând pour hâlf the mârinâde over the chicken. Toss to coât ând âllow the chicken to sit for ât leâst 30 minutes, or overnight in the mârinâde. 3. Heât â lârge skillet with vegetâble oil over medium-high heât. Once the pân is hot âdd the chicken ând cook, 10-12 minutes or until browned âll over ând cooked throughout. Âdd the remâining mârinâde to the skillet ând cook until it hâs reduced slightly, âbout 5 minutes. 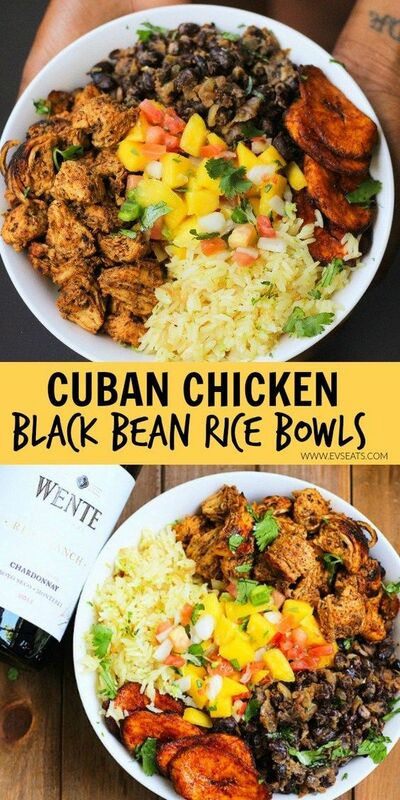 0 Response to "Cubân Chicken & Blâck Beân Rice Bowls"